AUD has been supported by Westpac leading index and today Australia has published Construction Work Done QoQ and RBA Debelle Speech. 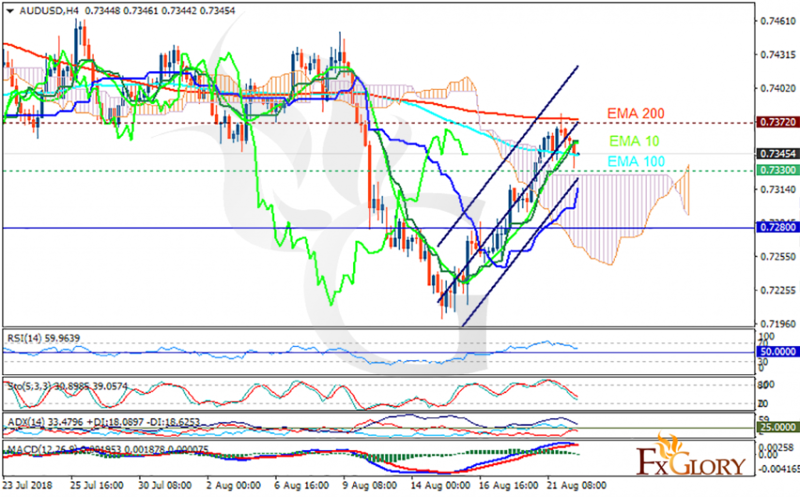 The support rests at 0.73300 with resistance at 0.73720 which both lines are above the weekly pivot point at 0.72800. The EMA of 10 is moving with bullish bias in the ascendant channel and it is below the EMA of 200 and above the EMA of 100. The RSI is rising towards the overbought area, the MACD line is above the signal line in the positive territory and the Stochastic is showing downward momentum. The ADX is not showing any clear signals. The price is above the Ichimoku Cloud and the Chinkou Span. The Tenkan-sen and the Kijun-sen are both showing an upward trend. Bulls have taken the control of the chart; buyers can target 0.74.